Stay Sick is a small but extremely popular clothing brand with designs created by Alexandra Metcalfe and is based in Glasgow. It is a family run business and hence all manufacturing is done locally in Glasgow with great attention to quality and detail. I did DM the Instagram page to ask a couple of questions and was met with quick and friendly replies every time which is brilliant. The fast communication makes the brand feel very personal and they really do care about each and every customer and order, offering many options for customisation. Of course, I had to get an item in the colour 'copper pink' because hello have you seen my blog name? I decided to go for the popular OMB swim/body suit in Metallic Copper Pink. 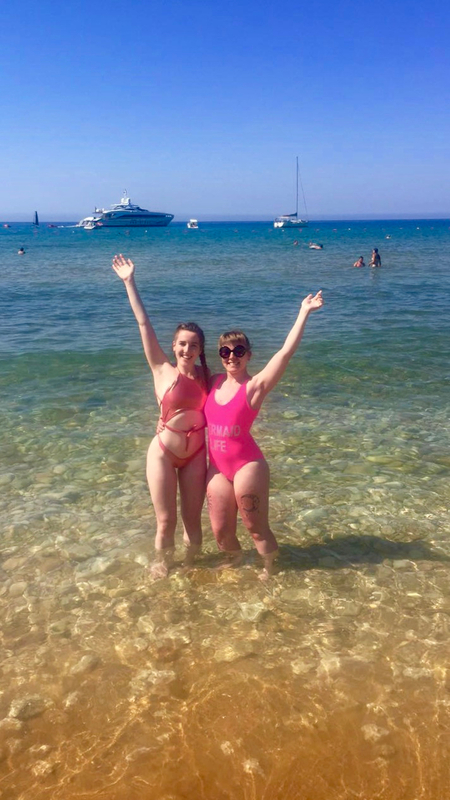 The suit cost £47.50 which may sound a lot for swimwear to some, but for a small local business creating pieces of this high quality, with fast communication and endless possibilities for customisation, this is a great price and I am extremely happy to support local brands like this. I went for size Small, which is described as a UK 6-8 with further measurements specified on Stay Sick's size guide. I knew the top half would fit as I have nothing going on up there lol. I was a little worried about the bottom as I'm definitely on the 8 side and not a 6 anymore on bottoms thanks to my squats. I believe you can send the brand a DM or an email and ask for one half of the suit to be a little bigger or smaller if you have any hesitations like me which is an appreciated extra step of personalisation as swimwear sizing is not always the easiest to judge due to materials. Luckily, the suit did fit me well and I was able to tie the top tightly with the adjustable straps so I felt comfortable and confident. I think I maybe need to work on my stance the next time I get swimwear photos, I was a little clueless on what to do with my face and body - not sure if you can tell or not haha. 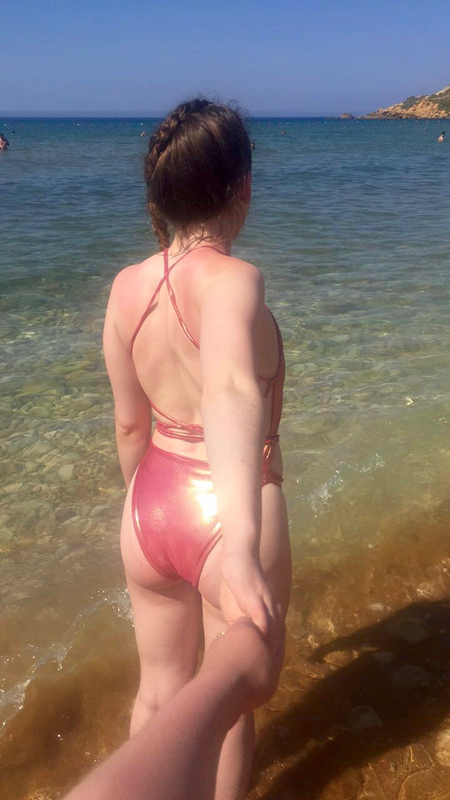 However, excluding the awkward posing in front of the camera, the swimsuit did make me feel an absolute 10/10 and the colour definitely made it feel perfect for me. My friends did warn me about dodgy tan lines, but as I told them, I don't tan, I just burn. So that wasn't an issue for me. Pale and proud. Earlier I said I was worried I'd put the swimsuit on, look at myself in the mirror and in photos and feel disappointed in my progress and basically crumble into a sad ball of sad sadness. 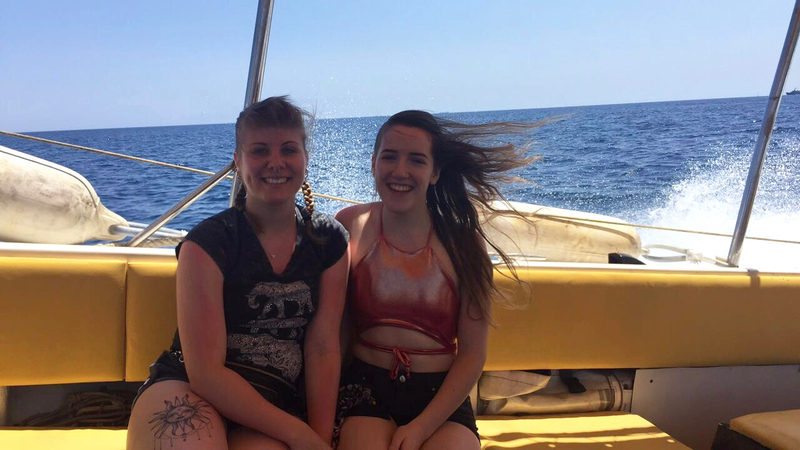 But luckily I actually felt very happy (and relieved) when I looked at myself in the mirror, which did take me a little by surprise if I'm honest. Of course, there are some angles I prefer than others, and I am still looking forward to improving my strength and muscles, but for now I am happy with my progress and that is such an incredible feeling. I'm doing what works for me and what makes me feel good and happy, which is very important. Stay Sick even reposted two of my photos on their Instagram which obviously made me feel fab too. If you are looking to treat yourself for any upcoming holidays or even just for your local swimming pool because hey why not look fab there too, head over to Stay Sick's website and enjoy browsing all the beautiful and colourful gems they have available. Be sure to check out their Instagram @xalex_stay_sickx for more images and customer shots too. Please do note however that you only have till the end of July to order as the owner Alexandra is going on maternity leave and won't be reopening till the New Year! So hurry over now even if your holiday is in December or January - go go go. And be sure to let me know if you do order anything from Stay Sick - I'd love to see what you choose!